This week second graders had a great time using the app Explain Everything to demonstrate their learning about the beginning, middle, and end of a story. 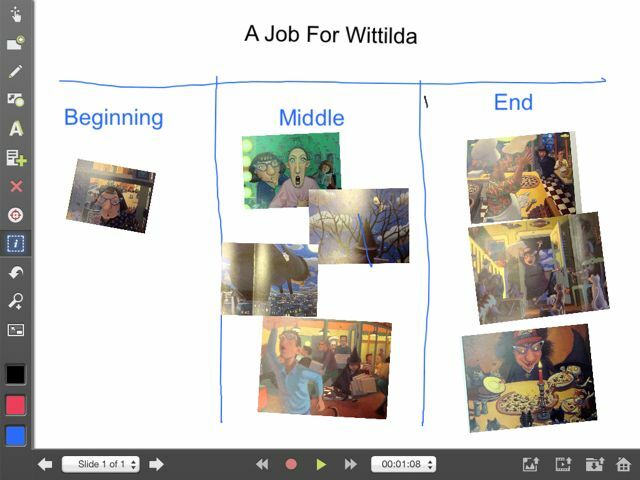 First I took screen shots of different illustrations in the book we read this week, A Job For Wittilda, by Caralyn Buehner. This is a great Halloween read aloud and fit perfectly with this app. I added the photos to the iPad camera roll and then easily transferred and resized them. I made a template for Beginning, Middle and End and saved it for other times. Then I “stacked” those photos from the story along the top. Students took turns moving the photos into the appropriate column. This is a highly versatile app and well worth the $2.99. Kindergarten–Poor Farmer Brown. He doesn’t like Halloween. In Doreen Cronin’s Click Clack Boo, he tries to avoid the Halloween party that the farm animals have by pulling down his shades, and setting out the Halloween candy, but Duck coaxes him to the party after all. Kindergarteners had fun using our Visible Thinking Routine, Plot Prediction, to guess whether or not the farmer would ever get to the party. First Grade–For a post-Halloween story, first graders heard A Pumpkin Story by Mariko Shinju. This lovely, quiet story of a man who makes an entire village out of pumpkins was the perfect book for the day after Halloween. Third Grade–Third graders heard Mice and Beans by Pam Munoz Ryan. With its wonderful illustrations by Joe Cepeda that tell the story within the story, it was a perfect book for practicing their observational skills. We used the Visible Thinking Routine called Plot Prediction to figure out both stories! Fourth Grade–Fourth graders heard their traditional scary Halloween story, “A Grave Misunderstanding” by Leon Garfield.. A spooky tale, told from the point of view of a dog, gave them a chance to practice the Visible Thinking Routine Circle of Viewpoints. Fifth Grade–Fifth Graders heard their traditional scary Halloween story,” Duffy’s Jacket” by Bruce Coville. This is such a well written ghost story and just the perfect about of “scariness.” We talked about the Writer’s Craft (a VTR) and looked at how the author built suspense though the use of short, rhythmic sentences. The humorous ending is always a surprise and brings lots of laughter. Sixth Grade–Sixth graders reviews NonFiction Text Features this week and began working on their packet. They have to find books that demonstrate each text feature and tell how that feature helps them understand what they are reading.